You are at:Home»2013 Holiday Gift Guide»Personalized Jewelry Make Fabulous Christmas Gifts! Believe it or not the holidays are just around the corner. With less than 50-days until Christmas many of us will be scrambling to find that perfect Christmas gift for our loved ones. For me, it’s finding mom the perfect gift. What do you get a woman that has everything and is picky? Honestly, I go though this every year! In the paste I’ve spent countless hours browsing online and offline just to find mom the perfect Christmas gift. This year, and for the first time in as long as I can remember I have her gift already picked out and it’s only November! What a miracle! And thanks to NamePlateDepot for making it so easy this year. 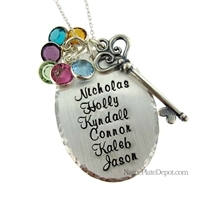 Name Plate Depot offers some of the finest personalized jewelry around. You can order engraved necklaces and personalized mothers necklaces for mom this year and rest assured that she will adore her Christmas gift this year! I absolutely feel in love with the Antique Victorian Key Handstamped Pendant which is exactly what I am ordering my mom for Christmas! Not only will mom adore the Victorian style, she will simply cherish it as mother would! Over the years I’ve looked at different “Mothers rings” for mom and I’ve come to the conclusion that rings are simply not my moms style. However, a few months ago, I did notice mom wearing a handstamped necklace. Which tells me she is going to fall in love with this exquisite mothers day necklace! 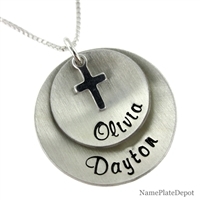 And if your mom prefers less bling Name Plate Depot offers breathtaking spiritual mothers day necklaces too! This mother blessing necklaces is simply elegant and, “comes with up to three names and a cross. The discs are given hand-matted finish. This blessing pendant comes with sterling silver box chain” Engraved Bracelets that are perfect for both Mother and Grand mothers. And if you can’t find what you are looking for, NamePlateDepot will customize jewelry just for you. Their motto is, “If you can imagine it,we can create it”. I know if you’re anything like my family buying for mom is the hardest gift to settle on. I’m more than convinced that NamePlateDepot can help you find the perfect piece of personalized or custom piece of jewelry for your mom or grandma! NamePlateDepot has been generous enough to offer one lucky Mom Blog Society reader a chance to win a $50 gift card to shop for mom! Simply click the image below to enter the Rafflecopter for your chance to win. GOOD LUCK! Previous Article$50 Gift Card from NamePlateDepot! Next Article Complete Spanish Set by Little Pim So Your Little One Can Learn Quickly! I love the Antique Victorian Key Handstamped Pendant, very pretty and lots of room to put my babies name on it! I really love the “mother blessing necklace” it has a simple elegance to it that really appeals to me. I love many of them, but with four children, I would need the Antique Victorian Key Handstamped Pendant to hold all of their names! It’s a lovely choice indeed! I really love the Antique Victorian Key Handstamped Pendant. It’s perfect for both myself and my mom to hold all my daughter’s names and my mom would adore having her granddaughter’s names on one for herself! I love the Antique Victorian Key Hand stamped Pendant it reminds me of the type of jewelry my Grandma use to wear while I was growing up. I would want this one for me with my kids names and grandchildrens names on it. I LOVE the mothers blessing necklace! Personalized Mothers necklace because my Mother in law has 5 boys and I would love to get it for her with their birthstones in it, my mom had 4 kids and I would like to do the same for her! I have never seen one big enough for 5 kids! I would love the hand stamped pendant for my mother. It has enough room for all their names and it’s simply beautiful. I love love love the mothers blessings necklace!! But I love almost every single necklace you have!!! “Hope I WIN ONE!!!!! I love the Antique Victorian Key Hand-stamped Pendant, I have 10 children and would wear this close to my heart. I have always liked the mothers necklace and have always wanted one.